From the moment you decide to start trying to conceive a baby, it's a wise idea to start taking a prenatal vitamin to gear up for what will most likely be the biggest events your body will ever help you achieve: pregnancy, the birth of your child and breastfeeding. There are an array of prenatal vitamin options on the market, and some doctors even write prescriptions for prenatal vitamins to their patients. Navigating the choices can be confusing, and you may need to try a few brands before figuring out which ones don't make you nauseous (mostly due to iron content) once you become pregnant. I thought I'd help take the guesswork out of your search by recommending my prenatal vitamin of choice to add to your list of possibilities: 365 Everyday Value Prenatal Multi from Whole Foods. 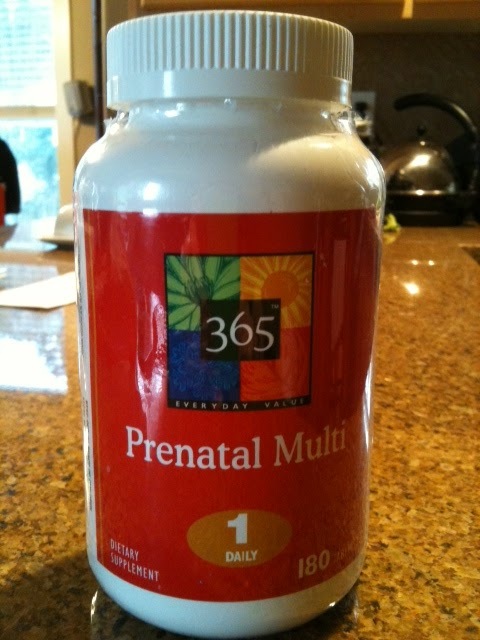 I am currently taking this prenatal vitamin, and I took it while pregnant with Mr. A and also while I was pregnant with and nursing Miss O. Taking a prenatal vitamin is a great, easy way to make sure you're getting the essential nutrients you and your baby need, even if you're not eating well due to morning sickness. Of vital importance for pregnant women to be ingesting in proper doses are folic acid, iron and calcium -- all of which are included in one of these tablets, to help supplement a healthy diet. I have an extreme sensitivity to iron, and the iron in this brand of has never bothered me. Another reason I opted for this brand is that these vitamins include additional benefits: raspberry extract for uterine support, and ginger extract to help combat nausea and stomach upset. *As with any vitamin, medication, herb, supplement, etc. Always check with your care provider to make sure it is safe for you and your baby to ingest.